MOSCOW (Sputnik) - US President Donald Trump and Russian President Vladimir Putin should proceed with their meeting as it will be beneficial for the United States, Secretary of State Mike Pompeo said following calls by several US congressmen for Trump not to meet with Putin amid hacking allegations. The hacking charges brought against 12 Russian nationals were followed by several US congressmen calling for Trump not to meet with Putin. "I am confident that President Trump's meeting with Vladimir Putin will put America in a better place. It's very important that they meet," Pompeo told reporters on Saturday as quoted by the broadcaster CBS News. The United States made the announcement about charges brought against 12 Russian nationals on Friday. Moscow has denied the accusations and called them a "shameful farce." 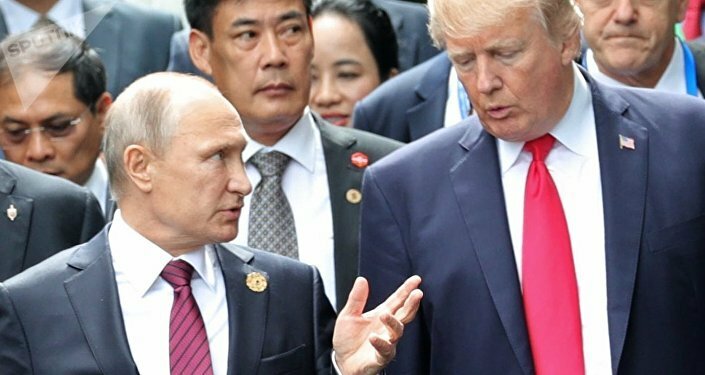 Since Donald Trump won the 2016 US presidential election, the American authorities have been investigating at vaious levels allegations about his campaign team's possible collusion with Russia, and have claimed that Moscow meddled in the US electoral process. The Russian authorities have repeatedly refuted all the allegations over the lack of proof presented by the US authorities to substantiate them. The summit between Putin and Trump will be held on Monday in the Finnish capital of Helsinki. The meeting's agenda will include the Syrian and Ukrainian crises, as well as bilateral relations, according to officials from both countries.